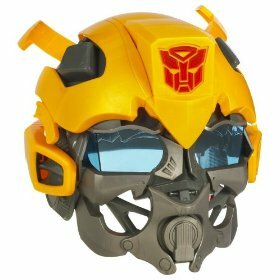 Role-playing helmet remixes your voice just like the Bumblebee voice from the Transformers 2 movie and features cool conversion sounds and movie-voice phrases. Suit up just like the Bumblebee character and prepare to save the universe with your voice-mixer helmet. The straps are easy-to-adjust for a comfortable fit. The helmet also plays realistic conversion sounds of the Bumblebee Autobot. Features three different modes and a number of electronic features. Switch on voice mixer mode to have your voice remixed with six different music styles. The helmet also plays realistic conversion sounds of the Transformers character changing from a car to a robot and back again, or his movie phrases including Bumblebee to the rescue.